Also known as the nictitating membrane or haw, the dog's third eyelid is something most owners aren't aware of until they see it for the first time. All dogs have this membrane found in the inner corner of the eye but it is typically noticed only when it is drawn horizontally across part of the eye. Its color varies depending on the dog's breed and can range from clear to cloudy. What Does the Third Eyelid Do? Deborah S. Friedman, D.V.M. and diplomate with the American College of Veterinary Ophthalmologists has several explanations. 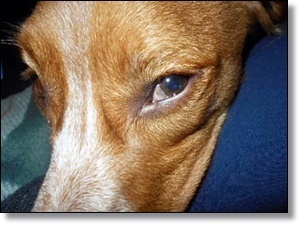 The third eyelid acts as the dog's "windshield-wiper" for the cornea, effectively removing debris or mucus off of it. This membrane is responsible for producing about one-third of the dog's tears, since it has one of the most important tear glands attached at its base, and its lymphoid tissue acts like a lymph node producing antibodies to fight off infections. It also helps prevent injuries to the dog's cornea. In dogs and cats, this membrane is not normally visible other than when the animal is sleeping or suddenly awakens from sleep. Indeed, if you lift the eyelid of a sleeping dog you'll likely see the whole eye covered by the third eyelid. The dog in my pictures awakened suddenly after resting on my legs, and once she was fully awake, her third eyelid re-positioned normally. However, the prolonged presence of the third eyelid, even when the dog is bright and alert, often denotes some sort of medical problem. In the next paragraphs, we will see some common and not-so-common medical issues associated with the abnormal appearance of the dog's third eyelid. 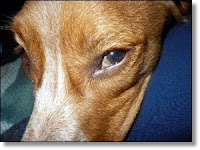 To read more this story, click here: Why Is My Dog's Third Eyelid Showing?